The King is dead! And your eyes are set on the throne. To be victorious in the coming succession struggle, you must spread your influence across the countryside. Every space you capture brings you one step closer to the crown! Your foes will field a set of pieces identical to yours, so you will need to outwit and outmaneuver them to succeed. Weighing the choice between capturing valuable cities or larger swaths of forests and fields will be a key concern. Every play will vary, as there are twelve 6x6 duchies that will fit together to form the kingdom. In addition, the game includes two sets of units and cards for each color. Before playing, you choose one set to use. 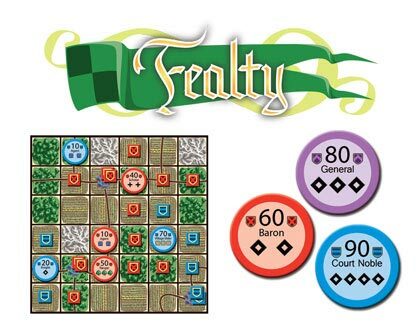 One copy of Fealty contains enough pieces, boards, and cards to play two simultaneous two-player games or a single two, three, or four player game. 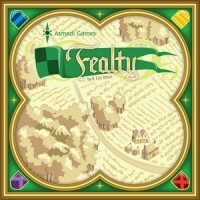 Add a Review for "Fealty"